Enter to win, mon amis! Bonjour! 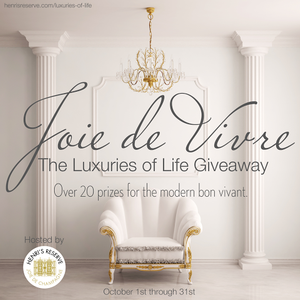 My Joie de Vivre: The Luxuries of Life Giveaway is here! As a connoisseur of the finer things in life, you will find these gifts fantastique! __ brands have come together to celebrate style, sophistication and luxury. Quite the soirée! One lucky winner will take home the entire set! Everyone who enters will receive something afterwards as a thank you. The giveaway will run from ___ to ___. Entering is easy. Simple select your entry options on Rafflecopter below. The more points you earn, the better your chance to win! Below the entry form, you will find all of the prizes from our generous donors. Please visit their websites, as well as our sponsors' sites. Please share with your family and friends. Good luck! First, I must thank our sponsors! Merci, mes amis! And of course... the elegant brands! Merci bien!